Finding the best hoverboard for your child is sometimes confusing and with so many to choose from it can be a challenge to find which one is best. There are so many different types on the market and with different brands, prices and all varying in quality it can get confusing. However, to make this easier we have reviewed 15 different hoverboards to help to make choosing easy and easily find the best available. You can definitely find the best type for your kid here, both in terms of price and quality. All items are certified and meet a high regulatory standard. Children’s Hoverboards make great gifts as we know and are the latest trend for Kids who love riding. You might have seen them whizzing around town or at the mall, depending on where you live. Hoverboards take elements out of skateboarding and the electric scooter to create the awesome riding experience kids are all talking about. In this review of where to buy a hoverboard and what to look for in a good hoverboard, you will see we have picked based on quality, speed and age range. We help figure out what features gives your child the best user experience, both in price and functionality whilst riding the hoverboard. There are more safety and guidance further down in the review on hoverboard gear for those wanting information like hoverboard accessories, safety, Bluetooth and other facts and features that might be ideal for you and your kid to know before riding their hoverboard. 9.5 What is Hoverboard UL 2272? Our top hoverboards have been selected for children who love the look, feel and rush of riding a hoverboard. Each one has slightly different features and is ideal for children of different age, capacity, and ability, which is stated with each product review. This is the perfect hoverboard for all kinds of urban adventures. Weighing only 20lbs, this great board has durable casing, zero emission engines and a splash proof design, making it both lightweight and ultra durable, making this a great choice for kids. It can also support riders of up to 220 pounds and can take inclines of 30 degrees. This board is also going to take your kid a long way. On a full battery charge, it can last up to 8 miles, and it only takes around 90 to 100 minutes to reach a full charge, so you don’t need to worry about your child getting stranded outside. Plus, it has a top speed of 7.5 mph, so its fast enough to feel the thrill of riding but not fast enough to be dangerous. What we really love about this one is the blue tooth app, which lets you check maps and battery levels as you ride, and even play music through the boards speakers, so your child will never get lost on this, and they can blast their favorite songs as they ride.. Whether your kid wants to do a quick trip to the grocery store, ride to class or just cruise around the park with their friends, the Swagtron T580 will make sure they do so in style and safely. This board is one of the lowest in price and for those wanting to get a cheaper hoverboard without dropping in quality, this is worth finding out more about. The Hoverzon S is both stylish and practical! It has all the modern features you’d expect, from solid tires to LED lights it has it all. With two 250 watt motors, this hoverboard can go up to 8 miles an hour, which is a good speed for kids, and it’ll travel 11 miles before needing another charge. Furthermore, this has Hoverzon’s Aegis management system protects and helps conserve battery power. So as long as your child plans ahead properly, they won’t get stranded and have to carry it home. Not only will this slick red board turn heads when your child is riding, you can also be confident that they are using a board built with precision, control and safety as a primary concern. This cool self balancing scooter has some of the most impressive specs we’ve seen. Its 350 watt motors give it a cruising speed of 6 mph, which is brilliant for a kid, and its battery will last roughly 2 and a half hours, making it great for riding around town, playing in the park, or going back and forth between home and school. This board only weighs 22lbs, and it can take riders weighing up to 225lbs. We also really like that it has an auto shut off built in, so it will shut down if not in use after 10 mins to conserve battery life, so it won’t drain away if your child forgets to turn it off. Overall, this is a very high quality and easy to learn set of wheels, and would make an amazing gift if you want to find a hoverboard for 11 year olds or above. The Tomoloo is really a brilliant hover board for teens and older children. It has a very stylish and futuristic design which is also very safe. its shell is high temperature resistant, fire retardant and very tough, so it really has the best of both worlds. What really drew us to the Tomoloo was the fact that it can accommodate the bigger kids easier than a lot of other boards. This takes the weight to 265lbs, so its good for kids, teens and even adults. it also has a max speed of 10 mph, so its a little bit faster than a lot of the other boards, but still not fast enough to be dangerous. You can also get up to a whopping 12 miles on a full charge of battery, so its brilliant for life on the go. Also, we all know how much teens like to show their individuality, and the Tomoloo lets them configure the colors and lights using the iOS and Android apps. With that kind of control, this will make a great hoverboard for a 14 year old or older, and they will love customizing the lights almost as much as riding it. 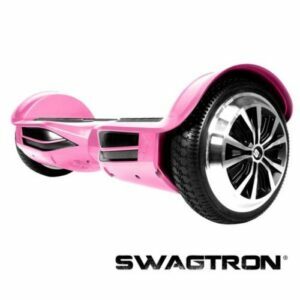 The Swagtron T6; not only has a cool name, its one of the most awesome boards available today. This robust little set of wheels can travel at speeds up to 12 mph, and it can go for around 12 miles on a full battery charge. It can also support a rider weight up to 420 lbs and has big 10 inch tires, so this will make it a good hoverboard for teens or bigger kids. This is also one of the most durable boards we’ve come across, and its body is made with of high-grade aluminum guards, and this board has a Water Resistance IPX4 Certification. The thing to really watch out for here is that this is a heavy board that weighs 32 lbs, so its a might be a bit too bulk for younger kids. Therefore, we recommend this one for older kids and teens. However, we have to give you an additional warning with the Swagtron T6; as this is big enough for parents to use, you might end up in a big squabble at the dinner table deciding which member of the family is allowed to have the next time. Taking you up to max speeds of 7.5 mph and giving you a huge distance of 20KM on a full charge (riding on flat surfaces), your kids will love this cool board. The Skque board really does have safety as a primary concern, with its improved motherboard with professionally tuned gyro sensors offers your child the smoothest ride possible. It also has a super strong shell and an enhanced chassis to give you maximum durability. We also really like the fact that this Skque hoverboard comes with LED lights equipped, so we know that our kids can be seen easily if they decide to take it out at night. The Skque hoverboard also comes with 6.5, 8 or 10 inch wheels, so you can choose the right size for your little rider. This also means that you can swap out the wheels for bigger ones down the line, so if you’ve got a kid who is due to a growth spurt, this could be the board for them. Priding itself on being the board for all ages and levels, the OXA board is specially built for younger and smaller kids to get to grips with, and their website even boasts that a 5 year old can get the hang of it in 30 seconds. It has two riding modes, one normal mode and one for beginners, and it can take a minimum weight of only 11lbs to 330lbs, so even younger children can try this. With its advanced new gyroscope and fast acceleration sensor, the precisely monitors and user’s weight and center of gravity, and it adjusts itself accordingly to give them a smooth and comfortable ride. The 350W powerful motor ensures a strong stable power output, and it can even handle inclines up to 45° and get over plenty of bumpy surfaces.It also has smart headlights built in, so your little one will have good visibility if they decide to take it out after dark. Overall, this would make a great hoverboard for 6 years old and above, as it is specially made in order to accommodate smaller and beginner riders. Go anywhere with this powerful hoverboard! With max speeds of 10 mph and a large max distance of around 10 miles, this hoverboard has some serious power under the hood! Better still, it has specially designed anti slip wheels for maximum safety as your child zooms around on this great self balancing scooter. It also comes packed with modern and high tech features, such as LED headlights and battery indicators, and it has two mother boards and a double control system for a stable and enjoyable ride. 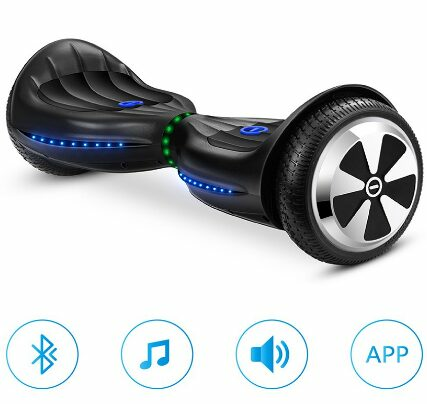 This board also comes with a smartphone, app, with lets you do all kinds of cool things, from streaming music to the board’s blue tooth speakers to changing the riding modes. With a maximum weight of 220lbs, this will be a great hoverboard for 8 years old and above. Your kid will love cursing around with style and flair in this excellent UL 2272 hoverboard. This swagton can go on speeds of over 8 mph, and when hitting distances of 12 miles and up on a full battery charge, you won’t have to worry about it running out of power as long as your child plans ahead before hitting the road. We know how much you value the safety of your little one, and this board doesn’t skimp on any features. It comes with a battery shield, LED lights for when the sun goes down, battery energy monitors, and safe stop feature to ensure your child is safe when riding. The Swagtron T1 is advertised as being recommended for all ages, so as long as your child is under the 220lbs limit, this might be a good choice for them. Still, we do recommend taking extra special care of you are planning to buy a self balancing scooter for a child under 8 years old. 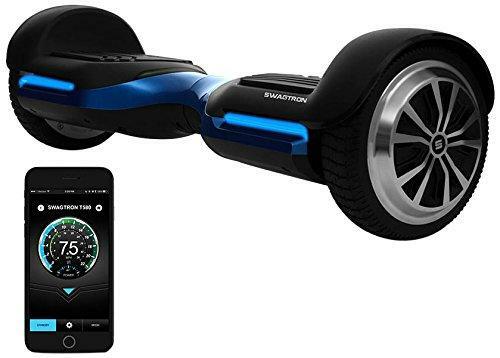 This SWAGTRONTM T5 board makes a great gift choice and is an awesome hoverboard. The brand is SWAGTRONT who are innovators of the hoverboard. Known for producing some of the best hoverboards in the world at the moment. This hoverboard comes with a hands free smart piece of kit and is really easy to use. This is setting the tone of the hoverboard review to make sure only the best survivor in this hoverboard race to the winner spot. This swift moving hoverboard (200 watt’s) is smooth and is first in the list with its top speed of 7 mph and max weight capacity handling up to 220 lbs, it’s a real contender with great value for money. 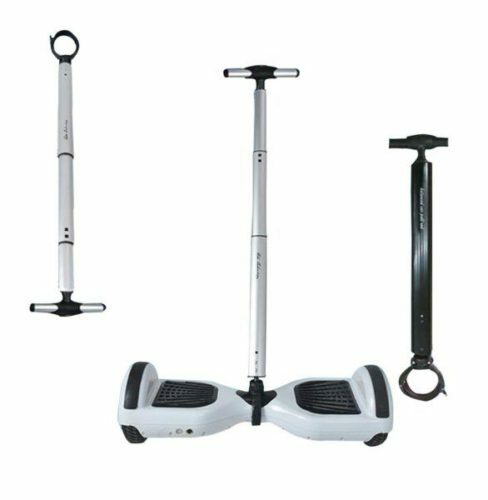 This board is self-balancing and has a proven track record of high performance and durability, it’s electrically certified with pass safe Swagtron approval. 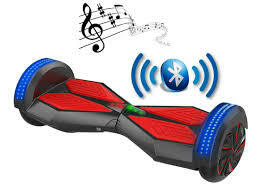 The SwagtronT5 fresh out the box comes with a charging/adaption, user manual and the SWAGTRONTM T5 board. The board comes with aluminum wheels and tires that have A+ traction for easy riding. The pedals where the footrest are non-slip and to ensure less likelihood of slipping. The Swagton T5 has downhill traction and stabilizes when at higher speeds than what would be on flat terrain. There are two different modes, one for learning mode and for beginners and standard for normal riding. The multi-layered technology offers safe and secure protection from the hoverboards battery and any likely hazardous areas, which includes incombustible components all governed by a smart management system designed to secure your child’s safety in the unlikely events that can sometimes happen. 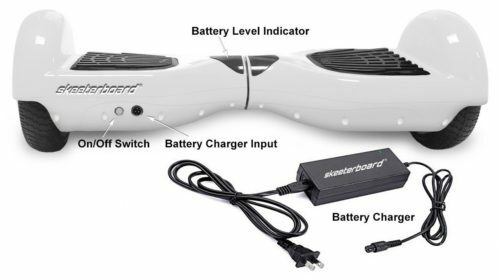 The hoverboard is motorized and includes learning mode instructions, bumpers made of the latest rubber and battery indicators which make time and planning ahead easy for the days boarding events. The battery management system is some of the latest in design and will make those young ones in the loop and not child left confused. The power has been upgraded and can power through terrain where it would have otherwise struggled, which will meet most users needs. This hoverboard is like back to the future all over again, but will so much more style. This comes in at the lower-end of the price range but is a good solid product. 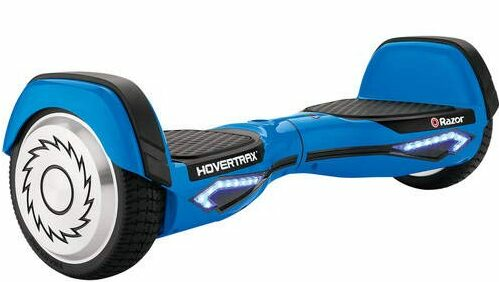 This Swagtron hoverboard is going to be a firm favorite with your 10 year old whatever they do with it. With a zippy 12mph top speed and a max distance of 12 miles on a full charge, whether they use it to get to their friends houses, cruise around the park or help mum and dad out by going on a quick run to the grocery store, the Swagton T6 will definitely be your kids preferred mode of transport. However, this board really comes into its own when you take into account as an off road hoverboard. This baby can ride over bumps and inclines up to 30°, and has even been tested to travel through mud, grass, rain, and gravel with its rugged 10 inch tubeless tires. We also love the fact that this can take riders weighing up to 420lbs, making this a great board for kids and teens of all shapes and sizes..
As you’ve probably realized, the Swagtron T6 is a real beast of a board, and with its high top speed and weight capacity, this is probably best for teens. As such, this might be our top pick for a hoverboard for 16 years old and up. If you’ve got a ten or a taller child who loves going off road and getting stuck in nature, this is going to be an excellent hoverboard for them. This Pink Hoverboard is an upgrade in the price bracket but not without good reason, its faster at 8 mph and features a larger 300 watt motor, so get the young ones ready for a good time boarding. The Swagton has the latest proprietary poly-carbonate casing with a beautiful shell that is matte finished, furthermore, it has an even wider grip than the Swagtron T5 offers, plus superior motor and gear stabilization traction. The built-in strap that comes with most T3 is ideal for limiting the amount of baggage needed to carry and handle. There are illuminating lights that shine bright and are color coordinated with a stop or go. Some further differences from the T5 hoverboard are; flame retardant materials, open wheel design, silicone coating and increased hazardous protection. The maximum weight capacity is the same as the Swagton T5 and the board weight is 44lbs, with an incline max of 30°. The Swagton T3 is similar in that it has the same balancing technology as its predecessor and is electrically sound in design, but some new features again are the Bluetooth speakers, 5 stage battery indicator and LED lighting, which all can be managed via the app, plus the carrying strap is a beautiful touch for the practicality aspect. This is similar to a hover skateboard, but with less physical demand and if you little girl is struggling to get out the house and skateboarding is a leap too far then this might be a good stepping stone forward, it works for some. This blue hoverboard is a boys version of the last with all the essentials but with an 8+ top speed and a huge run time of 60 minutes, which beats all so far. The 350 watt engine is the largest yet in this review and the quick 36V lithium battery change is quick and easy to operate and will last for years if used with care. I wouldn’t recommend for toddlers or pre-preschoolers because of the speeds involved, but I personally have seen kids under 5 using them, so just take precaution on the age thing, don’t want any unfortunate happenings. The user manual states “WARNING: NOT FOR RIDERS UNDER AGE 8 OR HEAVIER THAN 220 LB (100 KG). DO NOT EXCEED THE WEIGHT LIMIT OF 220 lb (100 kg)”, which clearly gives a specific age and weight guidance. The battery needs 6 hours at the initial time of receiving and some parents make the mistake not to fully charge, but this Razoe Hovertrax needs 6 hours at the beginning and then 4 after until the light turns green. Another mistake is to leave more than 24hrs on a charge, which may cause issues with the battery over the long-term. This hoverboard and others shouldn’t be charged in temperatures over 40˚C and used and operated under -10˚C, which might seem strange to say to some but not so strange to others who have large temperature ranges. One reoccurring feature is the training mode and riding mode which is great for children to get used to the board without finding the learning curve too much. My friend’s kid says this board is easy to mount and dismount, which might be a factor in decision-making time. This Kids Segway hoverboard is the on the high-end and has some new features with a dazzling increase in speed, power, and performance in general. The speed reaches a max of 10 mph and can hugely decrease travel time if you want to get around, up to 4 times fast actually. The sustainable power is 3 times more and is impressive at 1200W with a lithium battery of latest efficiency. There are mixed reviews about the knee control pad on the Segway mini-Pro and some say the control is more difficult, while others like it more. The guide bar can be used to assist with guidance and some prefer this feature to reassure the steering and overall riding experience. The gyroscopic mechanized balancing feature of the Hovertrax 2.0 tries to keep the foot platforms of the product parallel to the ground. In use, Hovertrax 2.0 then detects changes from “level” which are caused by fore and aft pressure on the foot platform(s) applied by the rider’s feet. Such changes are interpreted by the Hovertrax 2.0 as instructions to make the wheels move. Hovertrax 2.0 tries to re-level a forward tilt by accelerating and tries to level a rearward tilt by decelerating. The user manual states you should download the app called Ninebot Ideally, at the beginning the new user should find a friend and get some assistance, it’ll help with the initial grounding, which can feel strange and uneasy. 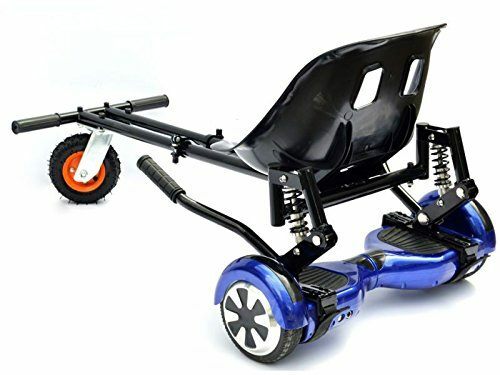 I think this board is becoming less desirable and more people seem to go for the hoverboard without this steering bar and knee control pad, but some like the additional steering so it really is a 50/50 call on where to go with it or not. The design features here are neat and come with a default blue light, red when braking and yellow any other time, but all this can be customized to suit your own preference. The compact structure means it can be easily put into the car for travel without taking too much room up and follow the tutorial designed for new riders, which then for safety, limits the miniPRO max speed to 4.3mph and after completing the tutorial the restriction is disabled which increases the speed to 6.2 moh for the first 0.6 miles and then to 11.2 mph thereafter via the app speed limiter. This top of the range All-weather board has been through some rigorous testing (159 tests) and for this reason, I’ve felt that out of a large number of available boards to make sure this is listed. Kids and the outdoors go hand-in-hand and the new feature of being able to go off-road and on rough terrain makes this an awesome hover-board. The speakers blast at 10W and add to the enjoyment of the ride, especially with the Bluetooth features and adjustable settings, it’s really a balance between Rock n Roll. The board can maintain an 18° degree slope and unlike the others can overcome certain obstacles that usually would have to be completely avoided. The wheels are designed for off-road also, which can be seen above and again helps with grip and stability. This can maintain a continuous ride-time of 10 miles total at high speeds, which allows for getting from A to B easy and without any unwanted power-outs. This is like a hoverboard just slightly different than the traditional hoverboards. The Segway one S1 is definitely suited for the older child aged between 16 years old and older. With all the modern features that a one wheel self-balancing transporter should have this is a great gift idea. This Segway can support a large weighted child at 220 pounds max capacity and weigh itself only 25 pounds. This mini hoverboard for kids is a high standard product and although different from the others previously discussed, it still functions on the same principles, but maybe a little more difficult in my opinion, due to the one wheel function. The current top speeds are 12.5 mph and can travel up to 15 miles with a full charge. The Bluetooth and app function on this Segway is easy to use and will help you monitor speed, locking and light settings. The tutorials online will assist at the beginning and help is available on request via the website. The SWAGTRON T580 Hoverboard is, in my opinion, the best simply because it has some really cool features and makes getting around easier than some of the others that I’ve reviewed here. This handles bumps on the move lets you not feel restricted to where you can go, which is the sense of freedom I feel, so for me, that’s a real bonus in comparison. This board also has a long battery-life and can keep going for up to 8 miles at a good pace of 7.5 mph, which is excellent overall. The speakers was another strong factor in my decision, because being able to cruise with music playing is a really nice touch, especially with the Watt output capacity like this hoverboard has. The Swagtron T5 reviewed earlier is a low-budget board and does most of what you’d hope to get from a hoverboard, it has a sturdy motor at 200 watts and will get you where you need to go, although not as fast as some of the other boards this doesn’t mean by any means it is slow with a top speed of 7 mph and a range of 7 miles, so this will get you there and back in most situations at a fast pace. The balancing technology in the T5 means that learning to ride is easy and will be a great first time buy if you’re thinking of giving it a try without breaking the bank. The Swagtron Hoverboard T5 again is a two-time winner here with having all the basic functionality of a great board, but with less risk, as it is slower and in my humble opinion the less speed the safer. This is the main reason for their being a reduction in potential danger, it’s a simple rule but applies to most things. Some people say the safest hoverboard to buy are the ones that go slow and are created for children with safety in mind. The hoverboard design is regulated to keep those using them safe. Safety whilst riding a hoverboard can always be an issue if the person using it is unfit to ride, so make sure your child is old enough to use a hoverboard and always check with manufacturing guidelines or state law if hoverboards are permitted. To use most hoverboards a child should be 16 years old and older, that being said however it is entirely up to the parent to decide on the appropriate age of use, because as well all know some kids develop at different rates than others. Some states have different laws on hoverboard use and in certain countries like the UK have banned all use less than 16 years of age, so make sure you find out what your state laws are. Some parents should consider before giving a toddler hoverboard as a gift. Some of the best hoverboards have Bluetooth and have app’s that run in conjunction with them allowing for the latest software updates and music streaming, it can be a lovely feature, but of course comes at a price. The locking feature with a remotely controlled hoverboard is a nice feature, especially for those who are busy and on the move and want to travel fast on their hoverboard to school. The hoverboard updates on the phone is ideal and help security or when their sibling is trying to get a sneaky turn without asking. Some Hoverboards have remote control functions and can be remotely controlled, although it seems pointless here, but it can be fun to show-off and use at the time. All have their own specific design, shape and grooves, but most have the same standard standing design with foot control, accept new adapted versions, which have been seen in Segway line and have an added knee supported feature. Why… you may be asking? Well, after extensive comments and customer reviews the knee feature seems to be a hindrance rather than any support, but personally I think weight can be a factor here in this decision-making process, so make sure you compare. Some people’s footing on the hoverboard can be similar to penguin out of “batman returns” which is when the supported knee feature can, in my opinion, can be of some benefit or if people are top-heavy and need a little extra support then this maybe be advantageous. Hoverboards have both minimum and maximum weight capacities for their riders, so you want to first of all make sure that your child weighs somewhere in between. You should also bear in mind if buying for a younger kid that their weight will change as they grow up, especially when they hit their teens. So, you might want to buy one that has a maximum weight which will allow your child to be able to ride for years and years. One of the most common question we get from parents is about the battery life. Obviously, a board isn’t going to do much good if its sitting in the charger for hours and hours, and you don’t want you kids to be disappointed if it cuts out after only a short ride. Like speed and range, this is going to change a lot depending on the which board your child is riding on. However, on average, a good board should last between 1 and 3 hours on a full charge, and most manufacturers claim their boards can go between 8 and 20 miles on a full battery. we’re a little skeptical of those 20 miles, as this probably relates to ideal laboratory conditions rather than the real world, but this should give you a good indication of the battery life of a good board. Most manufacturers recommend their hoverboards for children aged 8 and over, and we haven’t come across many that are aimed at anything below this age group. Still, if you can find something with 6.5 inch wheels , it might be comfortable for a younger child to ride. However, and we must stress this, we really do not recommend going out with the manufacturers recommended age, as safety is a major concern and you don’t want your kid getting bruised and scrapped because the board they ride was intended for older children. You’ll also want to get on on the slower end, perhaps 5 or 6 mph as a top speed. This will still be fast enough for them to have an amazing ride, but younger kids might struggle with anything faster. 8 years old, at least from most manufacturers, is considered the starting age for hoverboard riders. As your child is probably;y getting one for the very first time, you want to look for a few things. First of all, we recommend looking for something will smaller wheels, as this will be easier to balance and make a good hoverboard for a 9 year old. Also, don’t worry about getting anything too powerful or fast before your child knows how to handle it, so you might want to think about getting one that only goes up to 10 MPH or less. 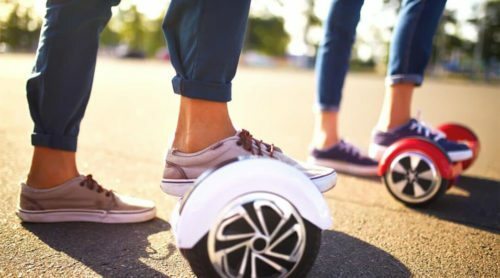 You have a lot more options and freedom when it comes to buying a hoverboard for 13 or 14 year olds, as at this age the children have much better motor skills and can handle something with a bit more power. Therefore, you can buy them something with bigger wheels and a bit of a more powerful engine. Still, don’t go crazy, these are still kids we’re talking about, and we wouldn’t buy them anything that goes too fast, like 30 MPH. You might also want to get them something that has blue tooth connectivity and speakers, so they can play their favorite tunes while they ride. The hoverkart hoverboard attachment has a titanium frame, its solid and has great absorption with pneumatic tires. The design itself, out of all the choices, I felt seemed was elegant with sturdiness and practicality. The tires are 6 inches in diameter and will maintain the high spring absorption that’s needed for certain journeys. This can adapt to most hoverboards and will assist if there are some special needs for example or even just for those who like being closer to the ground, its a nice cruiser and less stress on the knee joints, which will mean less fatigue for those who might be concerned. This Hoverboard Handling Strut comes with this Roti Garden 10 inch balancing handlebars, which will assist and add to the necessary balancing requirements that might seem limited or hindered by certain people riding on the hoverboard. The length of this strut is 50-106 cm and includes a safety handle that can assist the self-balancing needs. Safety whilst using a hoverboard is important and necessary for those who wish to ensure the safety for their kids, it’s not only that will be able to be better at riding, but also that the parent will have peace of mind and can do their parenting job. This YIMAN protective gear is extremely hard and with the PVC material will not irritate when wet due to its water absorption and quality material. Kids falling off your hoverboard is part of the learning process and don’t be fooled to think you or your child won’t fall at some point, that’s just not the case. 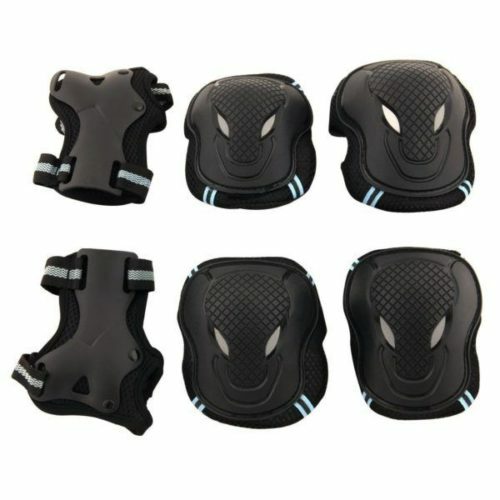 These knee pads and palm protectors will make that a little easier and protect those joints which are weakest at times of impact. All the protective gear is adjustable and easy to fit, so for a little extra safety, this can keep the kids safe and sound. This can also be used for other sports and not necessarily limited to the hoverboard, so it is well worth it in the long run. 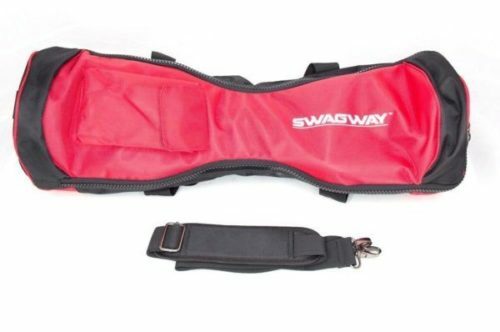 This Hoverboard bag is easy to carry board bag will make carrying effortless and convenient, it will house and protect ensuring the board can be with you at all times regardless of the situation. The bag has 2 zippers, which is easy to access and making storing your hoverboard never easier. Sometimes the rain can catch you out and with the waterproof nylon material the bag will keep the board protected, as long as the board isn’t thrown in the river or submerged in the sea. The adjustable straps means the user can fit their own specific needs without having a drooping uncomfortable attached bag. The bag has an extra pocket for the charger and is nice for an easy plug-in. Finally, the replacement warranty is excellent and leaves the buying process at an easy transition, because doubt is a killer. Wearing a helmet whilst on your hoverboard is important. Not wearing a helmet is dangerous and kids should always wear a protective helmet. Furthermore, it should always be fastened up and not let loose, which again defeats the purpose. The need for hoverboard beginners to wear helmets is self-explanatory and I would recommend it for everyone as standard, it’s an essential safety precaution, but for those kids that get fussy with wearing one, just get their favorite color. The consumer product safety commission is U.S. government-backed and ensures that the highest standards are met with regards to health and safety, which means they have tested the helmet in various setting. 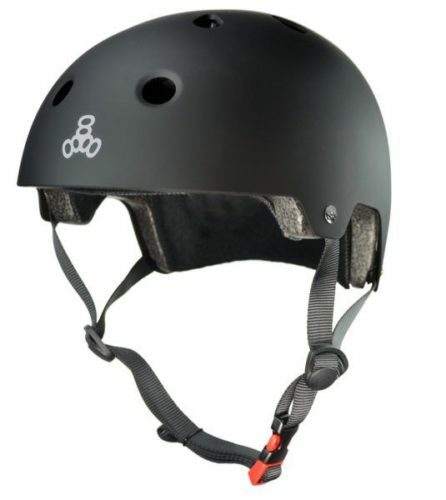 This helmet is CPSC approved and will keep your kids head safe from any dangerous falls. This helmet comes recommended for 5+ and can be used as a general helmet for all sports. Another one of the biggest questions we get from parents is asking what the general price range for an Electric Hoverboard is. Obviously, this is going to change a lot depending on the size and the model and even some other factors, such as where it was made; a hoverboard made in the USA might be more expensive than one from China, for example. We really do want to stress though that you shouldn’t be too thrifty, as you want the best quality hoverboard you can find so your child can enjoy it safely. Cool Hoverboards don’t come cheap, unfortunately, but given all the effort that goes into making a good one, they deserve the price they come with. Anything that seems too cheap, even a small hoverboard, is probably something the manufacturer cut some corners on. If it seems to good to be true, it probably is, and we’d be a bit suspicious of anything under $150. For a small kids hoverboard or a hoverboard for an 8 year old, you can expect to pay around $300-$200, and for anything bigger perhaps $300 to $400 or $500. Some of the top end board can even cost up to $1000, but you don’t have to spend that much to get a good quality and safe board for your 10 year old. What is Hoverboard UL 2272? So basically, if your board is UL 2272, you can be confident that it is fire safe. Safety is obviously going to be your number one concern when buying a hoverboard for your kid, so look for a UL 2272 hoverboard certification; it’ll be one less thing to worry about.